People attended the memorial service for former South African President Nelson Mandela at FNB Stadium in Johannesburg on December 10 which was broadcasted around the world. Sadly, the tribute to the well respected man was overshadowed with an embarrassing incident – the service was “interpreted” in sign language by Thamsanqa Jantjie who was reported to be a fake interpreter. That incident made the signing community around the world very upset. It also went viral and was published in so many international newspapers. How could the security personnel overlook him? Who did the hiring decisions and why that person was picked to make some gibberish gestures? Also, the event was several hours long, and normally a team of two professional interpreters are hired, especially for such significant events like these. While that fake interpreting incident was very upsetting and embarrassing, I think it was also some sort of a blessing in disguise because more people around the world would be aware that just someone who can wave hands is not qualified to be an interpreter. There were positive news of Lydia Callis interpreting for Bloomberg during hurricane Sandy emergency announcements, but many do not realize how often it happens that deaf people may get bad interpreters at any event. I would encourage you to read a great article by Kelly Rogel about unprofessional interpreters. She is not alone – I have had enough share of my experience myself, too, and so do many others like us. I remember having a bad interpreter for one of my job interviews who was asking me to write down what I was signing, for example, and I had to explain to the employer why that interpreter was not qualified even with her 20 years of experience. Also, professional interpreters should not only to be able to interpret and read signs, but also follow the strict code of ethnics. For example, I had a conversation with a respected speaker and communicated with him via two interpreters who happened to accompany me at an event. Both interpreters had good expressive and perceptive skills, but one broke the code of ethnics by taking over my conversation and interrupting me and the speaker – even though she was certified and had more experience than another interpreter who was not certified with only a few years of professional experience and yet followed the code of ethnics. For these reasons, it’s important that sign language interpreters be screened thoroughly. When attending events, I encourage event organizers to hire reputable agencies and freelance interpreters that I recommend to them. They are not familiar with sign language and cannot tell which interpreters are good or bad – only deaf people or those fluent in sign language can determine that. Another, also very important, thing that was unfortunately not discussed is the lack of access to information via quality real time captioning. The majority of deaf and hard of hearing people are oral using spoken languages and know a little or no sign language to benefit from interpreters, so signed events are still not “fully” inclusive, especially for those people. Also, sign language is not same for every country – what about deaf attendees from other countries whose sign languages are different from one interpreted into at an event? While the news are captioned on TV in USA and some other countries in the world, they are not captioned in online streaming videos. It is very important especially with the increased use of mobile devices. That was the issue with the past Olympics and Paralympics in London. I remember visiting Sea World with my family in Florida the summer before I started college. There was a sign language interpreter at a performance with seals and dolphins. While my family and I thought it was cool, I could not understand anything the interpreter was saying as I did not know any ASL. It was before I picked it up in college. If that event was open captioned, it would have been 100% accessible not only to myself, but also to my hearing parents whose English is not first language. 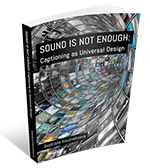 Even now I would prefer captioning for most situations as it is more verbatim than sign language interpretation. 121 Captions wrote an article, Pardon? We asked for access in English not BSL – where are our captions?, stating that real time captioning services were not provided at the National Disabilities Conference on July 4th, 2012, in London organized by Government Knowledge – despite requests from NADP (National Association of Deafened People) for it. It was only interpreted into BSL (British Sign Language) which left out many deaf/hoh people who use spoken languages. The article mentions that 70,000 deaf people in UK use sign language while about 10 million of deaf and hard of hearing people do not use it and usually rely on captioning and lip speakers (wording in UK for oral interpreters). Captioning access is very important to those who don’t use sign language, and not just to those who are deaf and hard of hearing, but also to foreign language speakers and others who may need it for various reasons. Even those who know sign language also prefer captioning for certain situations as it is more verbatim than sign language interpreting. Yet, that access is not as well known as sign language interpreting access. Many also do not realize that it is also very important to provide quality captioning services and not to rely on auto captioning or speech recognition. The article, Issues of Bad Captions and Subtitles, explains how many deaf Brits are frustrated with poor TV captions provided by BBC because they use voice writers instead of stenographers. I am often being asked if using speech recognition would be enough which is not. Like with bad sign language interpreters, I also have had bad captioners sometimes. Many even think that it’s enough to just have someone to volunteer to type for me on a QWERTY keyboard which is not as fast as typing on a steno machine. Although CART writers are trained as court reporters, court reporters are not even qualified to provide real time captioning as it is different from providing court reporting. Professional CART writers type at least 225 wpm with at least 98% accuracy – not something that an average person can do. While it is great that more people are recognizing the need for sign language interpreting access at public events, I hope they also realize that it is not the one and the only communication access used by deaf and hard of hearing people. Just like with qualified foreign language translators and interpreters, it is also important that aural information at events is provided via quality captioning and sign language interpreting. However, unlike foreign language speakers who choose to move to another country and can learn a new language, people do not choose to become deaf and cannot become hearing even with hearing devices. They would not have felt disabled if information was accessible to them in other ways than just via listening. Therefore, it is important that they get quality access to aural information via visual means. I wrote an article, ASL or CART or ALD?, explaining why certain deaf/hoh people prefer certain type of access and why even one type of communication access may not fit for all events. In the spirit of holidays, I would like to wrap up the article by sharing a heartwarming video of a 5-year-old hearing kindergartener signing the holiday concert for her deaf parents. It is also captioned in English. captioning, deaf, fake interpreter, hard of hearing, KODA, Mandela, sign language, South Africa.